I’ve never been to a Japanese Restaurant, so I thought it was worth a try, given the fact San Jose’s Japantown is 1 of 3 remaining historical Japantown’s in the USA. 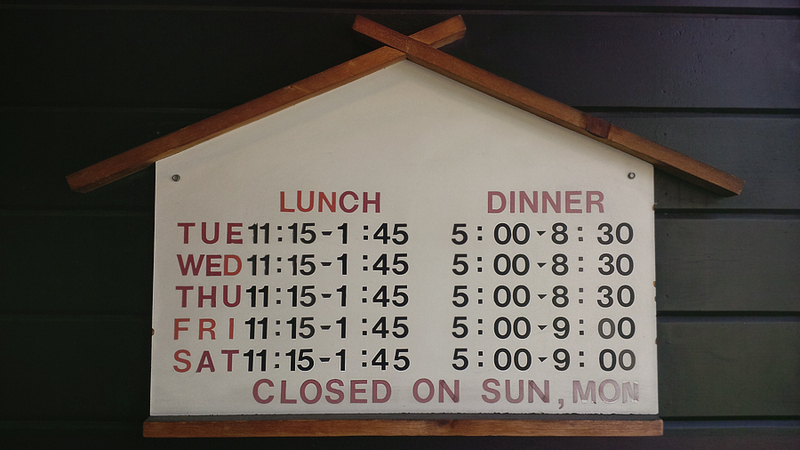 I wasn’t sure what to expect, but I had a peek at the menu beforehand so I knew a little bit about what to order. As someone who hasn’t tried sushi (I’m so not ready for it yet, even after trying Ahi Tuna Poke in December), of course I’d be the person to order the few chicken dishes on a Japanese menu. Aren’t Eastern Canadians supposed to love fish? Probably. But, I’m not an adventurous eater like some. 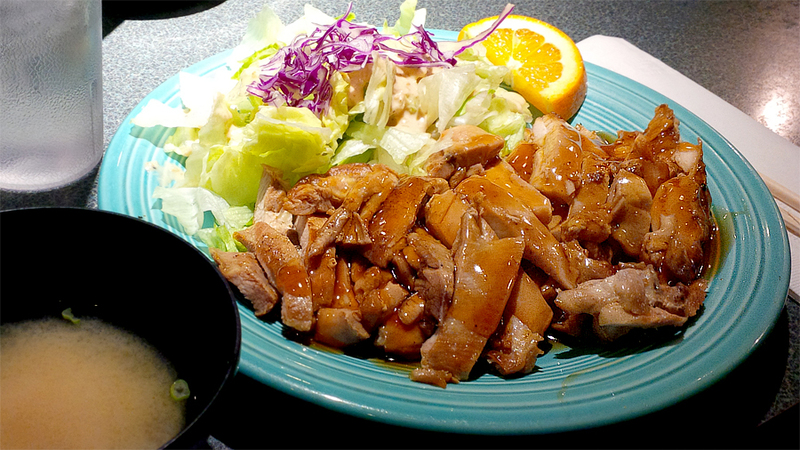 I ended up staying in my comfort zone and getting a tasting of chicken teriyaki and salad. 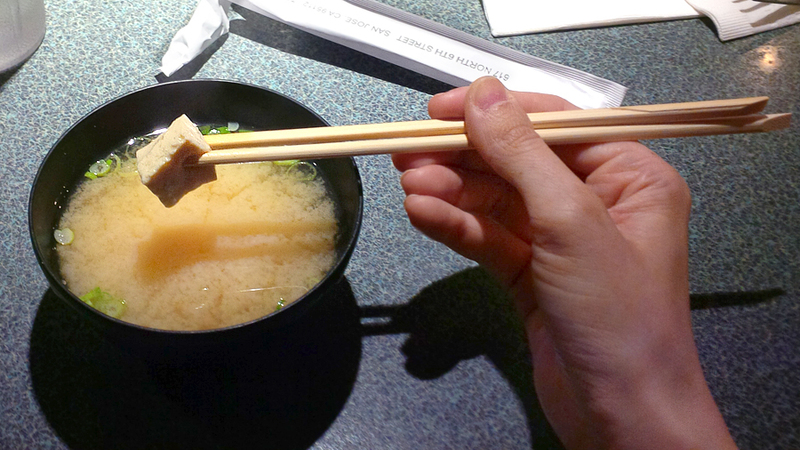 First came out our miso soup, where I dug out the yummy tofu with chopsticks. Because, yolo. I wasn’t sure if I was supposed to drink the miso soup, but I took it up with my hands and drank most of it before our lunch arrived. Minato is on the smaller side of restaurants, and the menu is nice and short. I admire that, because whenever I go to larger chains I feel like I have to flick through so many pages to decide on what I want to eat. The Guy and I ordered the same thing :) I wasn’t a huge fan of the salad, not much on it to be honest! The dressing was awesome, though I have no idea what they used. This is what you see when you walk in the first set of doors before you enter the restaurant. Towards the middle of the restaurant when you walk in, there is an area for kids prizes after they’ve finished their meal. I’m not too sure how the kids get tickets, perhaps after so many visits they can save up and pick out a prize for themselves. This sort of thing reminds me of my childhood, where we used to pick out prizes at a fair, or at a school event. Super fun, and I’m glad Minato is doing it too. After our bellies were filled with lunch, we ended up checking into our hotel at The Fairmont San Jose. Now that is one beautiful hotel, I’ll have a review of our ginantor suite we stayed in (bigger than our old apartment), later on! 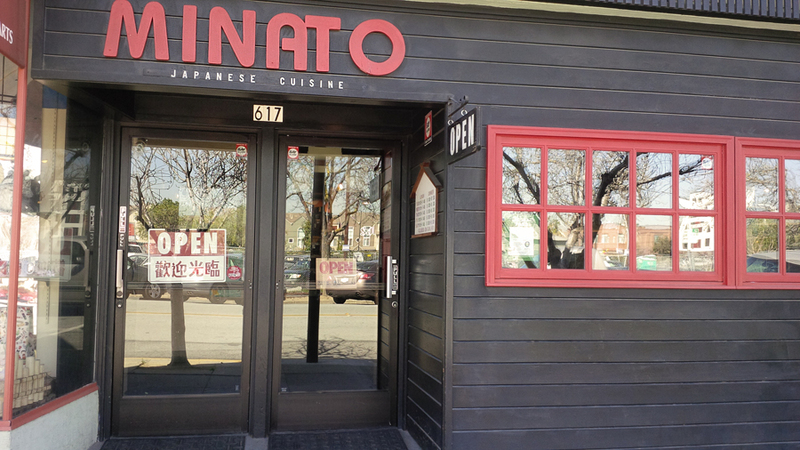 If you’re craving a bit of Japanese food when you visit San Jose, come check out Minato, it’s only a 1.5 mile walk from the downtown core in San Jose. Plus, it has a ton of rave reviews on Yelp, so many people have been enjoying it! Have you ever been to a Japanese Restaurant? What would you normally order? @Robin Rue (@massholemommy): I’ve been to a similar place that does that (not a sushi restaurant). It’s so fun hey? @Jamie: I’m not sure I want to try any sushi that has raw fish in it! I’m not crazy adventurous eater, either, but I love Japanese food. The simple flavors and emphasis on veggies is right up my alley. We love going to hibachi restaurants to see our food cooked right in front of us–so fun for the kiddos! I have started to like sushi, but only a few kinds since raw fish isn’t too appetizing for me. Since I love shrimp tempura, I tried a shrimp tempura sushi roll and it was delicious–great texture, too. My hubby can’t wait until I get even more adventurous! I will eat just about anything, but I’m not a fan of sushi. It has absolutely nothing to do with the fish, I just hate the taste of nori lol Looks like your meal was a good one! I love sushi and could probably eat it every day. My absolute favourite is sashimi (raw fish/ no rice). I was actually thinking about how my husband and I should go on a date this weekend. I love Japanese food and restaurants and it looks like this place was a great find. 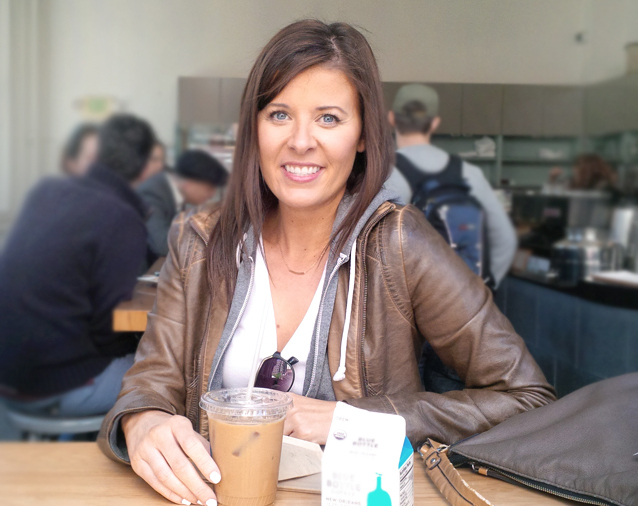 I love watching other foodies journey through new places! So inspiring to go out and try a new place and boy did that Miso Soup ever look good! YUMM! How wonderful! I’d love to visit the entire town. 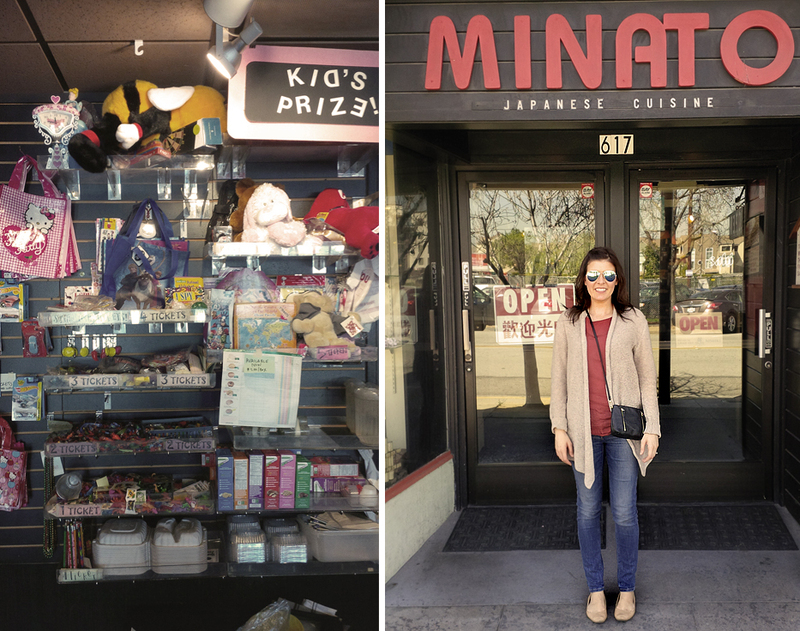 I didn’t even know such a thing as a Japantown existed. The food looks amazing, too. I am a HUGE fan of sushi and sushi restaurants! My favorite items to order are usually the staples spicy tuna & eel rolls. Also, adding the ginger dressing to everything gives all my sashimi a zesty zing! I just love it. I love Japanese food and it has been a while since I have enjoyed delicious sushi! My favorite is the California Roll and gyoza. I know this may sound random, but that blue-green plate, I have the same plates at home! Anyway, it sounds like you had an awesome time, you wrote a fabulous review. When I was a kid we would go to the local Japanese steakhouse every year on my brother’s birthday, his pick. I was like you, I always ordered the chicken dishes! No sushi for me either. It’s neat that they hand out tickets to the kids…I’ve never seen that before! I have been to my share of Japanese Restaurants, I normally white rice and whatever meat with some fresh veggies, I don’t go all crazy with what I’m eating. I love Japanese food, but I wasn’t always a fan. It has to grow on you I think. The looks great! Mmmm, looks good. I like Japanese restaurants. We just ate at one recently in our area. Always good food. I’ve never personally been to a Japanese resteraunt but there is one done the road from here that my husband keep hinting about. My daughter loves sushi but I have yet to try it. What an awesome adventure! The food looks super yummy. I am not a sushi fan, but I do like California rolls. I like them because they’re all veggie and no raw fish. Japanese is one of my favorite cuisines though it’s also because I’m half Japanese and grew up eating it. That restaurant certainly looks nice. It’s been a while since hubby and I ate at a Japanese restaurant. They look so good! We are huge fans of Japanese food in our family. We’ve gradually tried more and more off the menus and even find we like the bbq eel! If you haven’t tried it yet you should! sooo good! Looks like the trip to Minato was awsome! I’ve never tried any food at Japanese restaurant or somewhere. I really like to taste japanese foods, I’d love to visit in Japan one day. I love Japanese restaurant and I’m glad we have so many in my area. I usually order shrimp tempura with udon and chicken teriyaki. I’ve tried Minato. They have such great Japanese food selection! Love the maki and tempura! This looks like an amazing place to eat indeed. The food looks so delicious and now I am craving some. lol. I still have never tried tofu yet. Thanks for sharing. I love Japanese food a lot, his is a place I’d love to go eat at! Japanese food is my absolute favorite!! I wish I could eat sushi all day, every day haha!! Thanks for this awesome restaurant review! Your food looks amazing!!! So odd to see a restaurant that is closed in segments like this Japanese restaurant is! I wish we could make it Japanese restaurants more often the food is always amazing and filling. it’s good you’re trying new foods! :) i’m actually not a huge fan of sushi in general. i’ll eat it when i go places bc jacob loves it so much.. but if i had to choose.. i pretty much like to stick with the usual chicken, pork, or beef :P i think they always use a ginger type dressing on salads at japanese places. Your food looks amazing! I love to go to Japanese restaurants the food is always great! I love sushi but guess what? I used to hate it too, the first time I had it I wanted to gag… but when I fell pregnant with my daughter, thats all I craved for. Now I must eat it at least 5 times a month. Looks like an awesome place to eat. To be honest, I have never been to any Japanese Restaurant. I need to take the hubby sometime. I only know of one Japanese restaurant near us and we had a terrible time when we first tried out. Minato seems like a great place though, I wonder if there are more chains across the US or if its only local. It’s probably only local though, would love some recommendations for chains if you have them. That looks so good. I love eating food at different cultural websites. In fact, I was at a new Japanese restaurant that just opened in our area the other day. It was amazing. I am a huge fan of Japanese food, and this restaurant looks divine. It can be hard to find a truly good one. I’m a fan of Japanese cuisine and sushi is one of my comfort food. There’s so much art put into making this tiny dish. 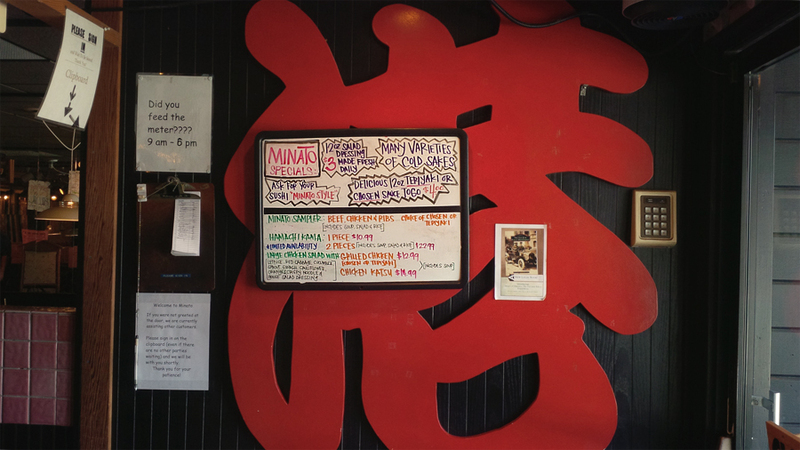 Minato sounds awesome and customers leave happy. Do they also have rice bowls on the menu? I wouldn’t mind the smaller restaurant or the smaller menu a bit either. Sometimes small is nice. Yum! I finally tried sushi for the first time last year – just the California Rolls. I haven’t been able to up the ante, yet. Your food looks so deelish! This looks really good, but you should for sure try sushi. It seems more intimidating that it is. The flavors in sushi is so delicious. Start out easy with not so crazy rolls and ease in. GL! I read your post, but somehow I keep coming back to your first sentence, which is you’ve never been to a Japanese restaurant. Wow! I’ve loved sushi since my parents introduced me to their cuisine when I was a kid. Today I eat all kinds of rolls, but surprisingly I am not a fan of anything with eel. Sushi is my absolute favourite! Next visit!!! Japanese restaurants are my favorites! I would definitely go for sashimi’s I just cannot get enough of those tuna’s! 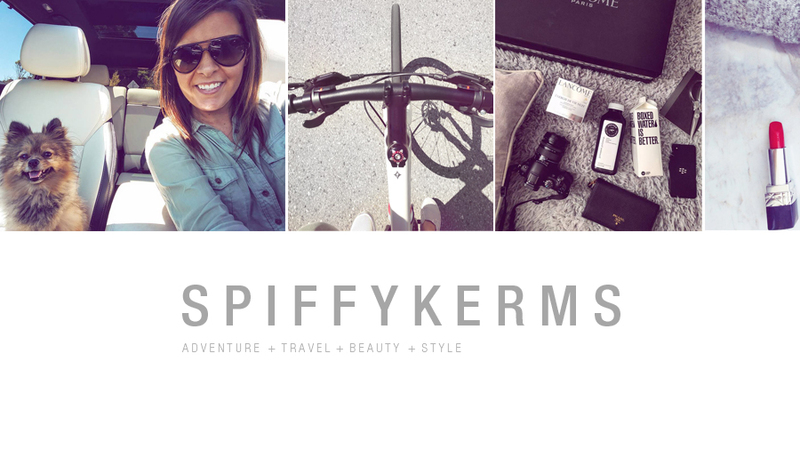 Breanna recently posted..Happy Friday + a Giveaway!